Herta Müller is one of the leading figures in the new generation of German writers. An ethnic German born in the Romanian Banat, she first came to prominence with her scathing yet poetic depiction of the anti-idyll of village life, Niederungen (1982).The literary texts and essays which followed catalogued the decline of the Romanian-German community and the degredations of daily life in Ceauescu’s Romania. Reflecting Müller’s move to West Berlin in 1987, the seminal novel Reisende auf einem Bein (1989) deals with the postmodern uncertainties of modern city life and casts a critical eye on contemporary German society. It was followed by further `autofictional’ texts exploring totalitarian rule and the `Angst’ it engenders. The Land of Green Plums, the English translation of the densely structured novel Herztier (1994), based on Müller’s experience of political repression in Romania, has recently achieved widespread international recognition though the award of the prestigious Dublin-IMPAC Prize. 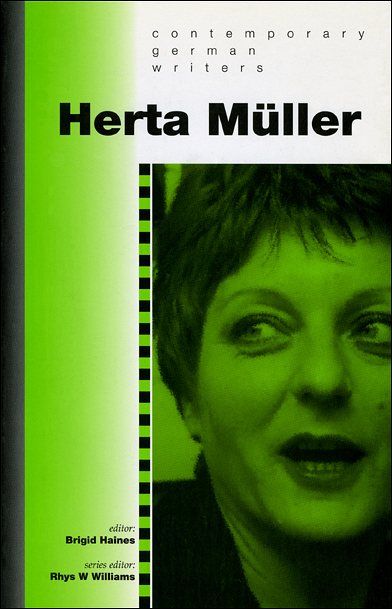 The first book in English to be devoted exclusively to Herta Müller, this collection of essays is intended both as an introduction for the general reader and a resource for the specialist. It contains ten previously unpublished short texts by Müller, together with a revealing interview and a biographical outline. Six essays by British and German academics interpret key texts in detail and assess vital aspects of Müller’s entire oeuvre. The essays are complemented by the fullest bibliography on Müller published since 1991.